Yes, you read that right. The entire Boudoir Collection is mine! I just couldn't resist these soft gorgeous pastels, and so last month for the first time ever I upgraded to the polish lovers box. This included Mae and Margot (from the Bombshell Box), Mona and Abigail (from the Classic With a Twist Box), Hannah and Noelle (from the Boho Glam Box), and Farrah, Hope and Annemarie (from the It Girl Box). 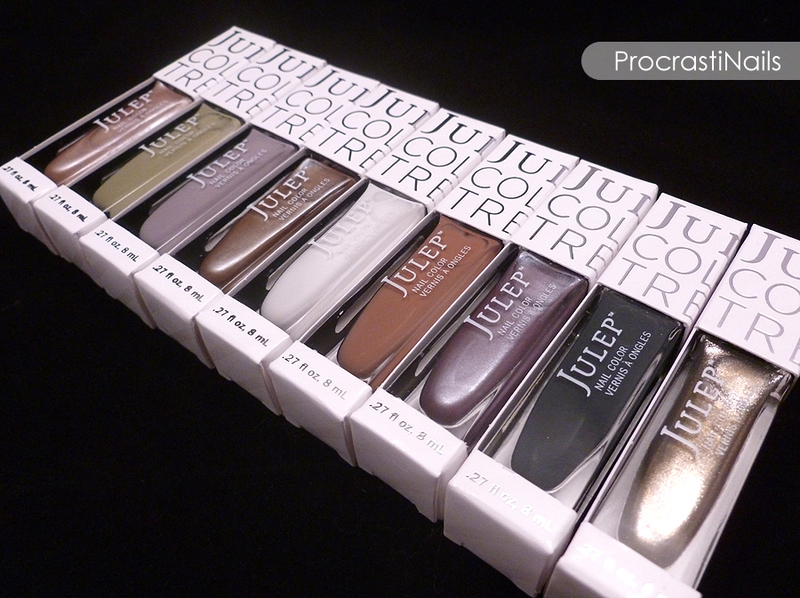 So hold on tight, because I have swatches and reviews for all 9 of these gorgeous shades! One of the things that drew me to this collection was the fact that aside from the normal crème and shimmer formulas, it came with a handful of shades that were described as having a satin or silk finish. I love me some interesting finishes and textures, and now that I've tried it I just can't get enough of this silk finish! For those who are curious about the difference: the satin finish polishes seem to be a flat matte, whereas the silk finishes are matte shimmer polishes. The satin finish left a bit to be desired, since it didn't have the same slight sheen that the last satin polish I got (which was Lola) had. "2014 will be my year!" The free gift this month was two small nail buffing blocks, which are timely because I've been thinking about picking some up and now I don't have to! I haven't tried them yet, but maybe I'll do a mini review for them when I do. Mae was one of the shades in the Bombshell Box for January, and it's described as a "soft lavender satin." 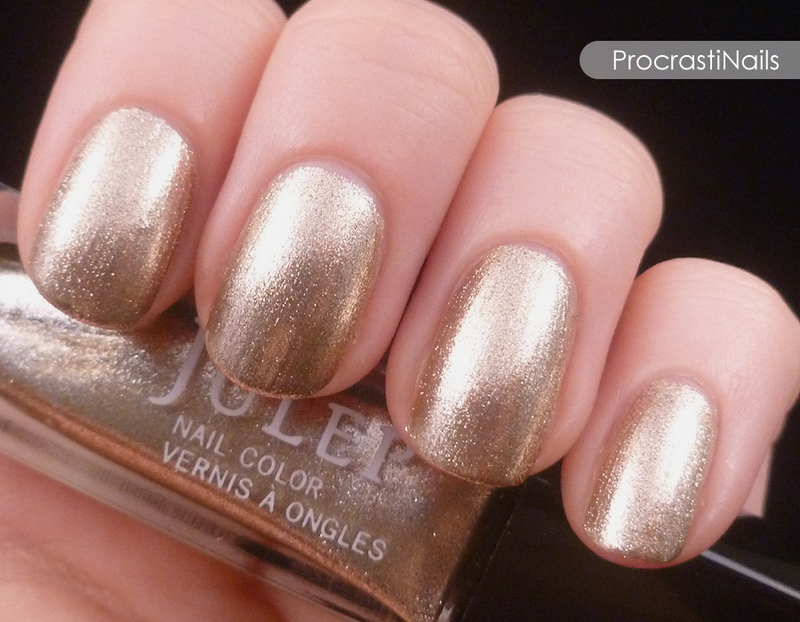 To be honest this polish was a bit underwhelming for me. I think I was expecting at least a hint of sheen in the satin finish, but as you can see it's a pretty flat matte. It's still a lovely shade of pale lavender, but without that little something extra in the finish I don't think this polish will get much use from me. :/ Oh well. 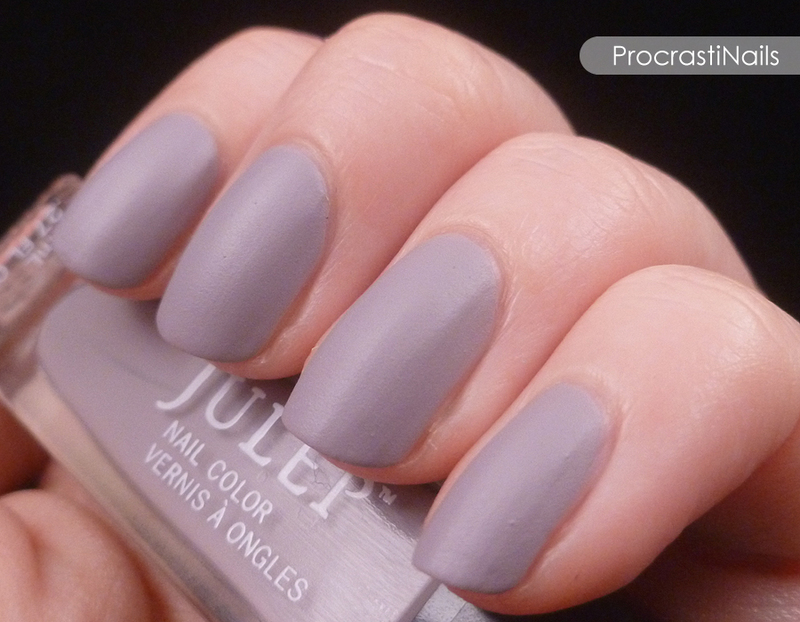 Pictured here is 3 coats without top coat, and as always Julep's formula applied wonderfully. 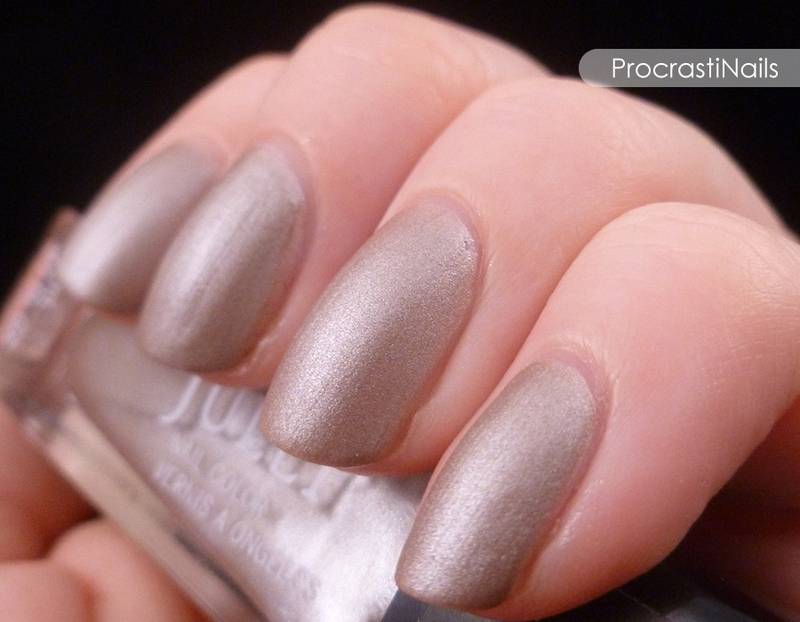 Mona is described as a "storm cloud grey crème," and was one of the two polishes in the Classic With a Twist Box. I'm going to have to challenge Julep on their description, though. I think it's a stretch to call this shade grey, when to my eye it comes through as a very deep and sophisticated dark slate blue. Either way it's a gorgeous shade, and I can totally see myself pulling it out to wear through this rainy and grumpy winter/spring weather. What you see here is two coats without any top coat. 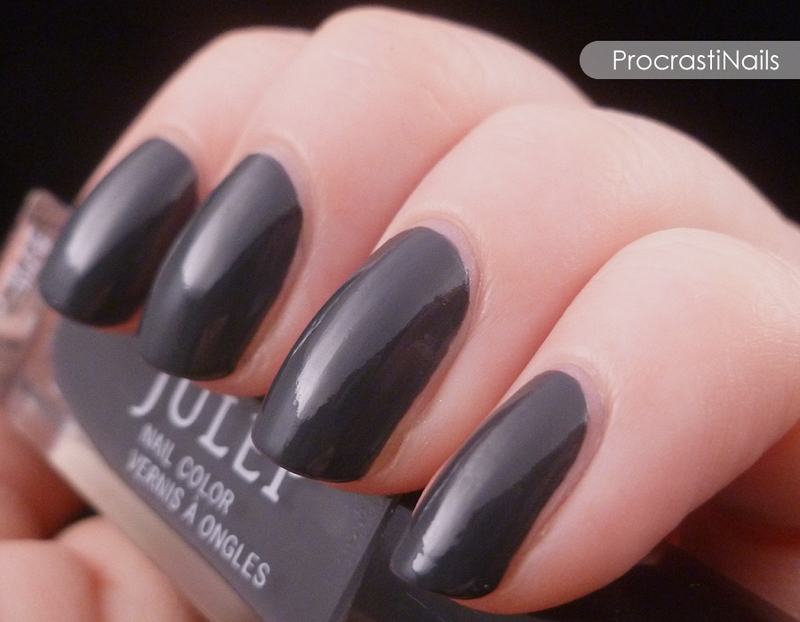 This polish is gorgeously opaque. Abigail is described on the site as a "light peony pink silk" from the Classic With a Twist Box, and this is where I start to gush over the gorgeousness of the silk finishes. You guys, I'm IN LOVE with this finish. The matte and shimmer combo is flawless as far as I'm concerned, and the delicate shade they chose for this polish is both girly and luxurious. I wasn't sure if this polish was going to build up to a full-coverage opacity, but after three coats I'm happy with how it looks. It left a wee tiny bit of visible nail line, but not enough to bother. I bet this would be cute as a jazzed-up French manicure. Hannah is one of the shades from the Boho Glam Box, and I'd have to say it's one of my least favourite colours in the box (mainly because I'm not partial to greens). That being said I don't hate it, there's just other shades that I much prefer. :) Hannah is described as a "sage crème," and I think that's an accurate description. It's a very antique-y shade, and I'm thinking of using it together with Annemarie to do an antique rose mani. Hmm! What you see here is three coats of polish, but if you do your coats thin you're going to need four. Noelle is the other shade from the Boho Glam Box for January, and this is hands-down my favourite polish of the lot (and it's also the one decorating my digits right now)! 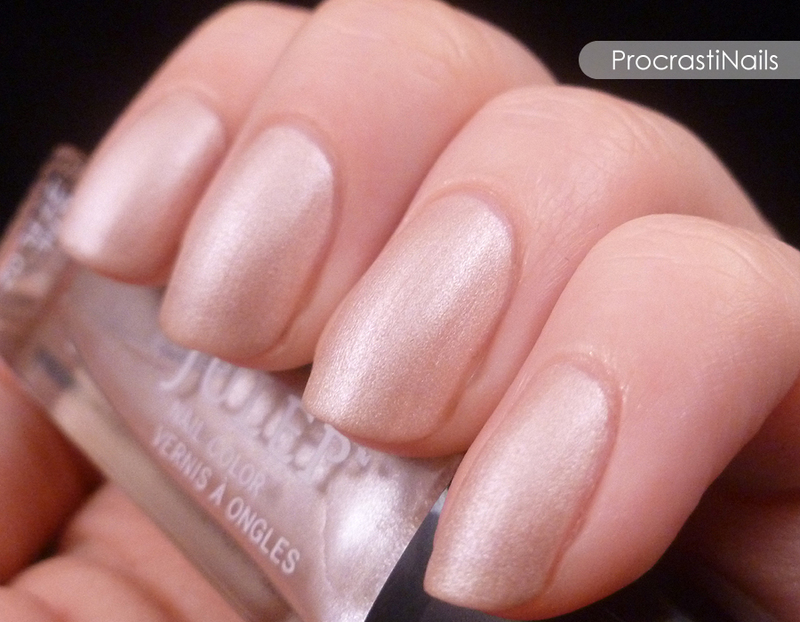 It's described as a "sandy beach silk," and it's a wonderfully subtle and sophisticated shade. Like I said earlier, I can't get enough of this silk finish! 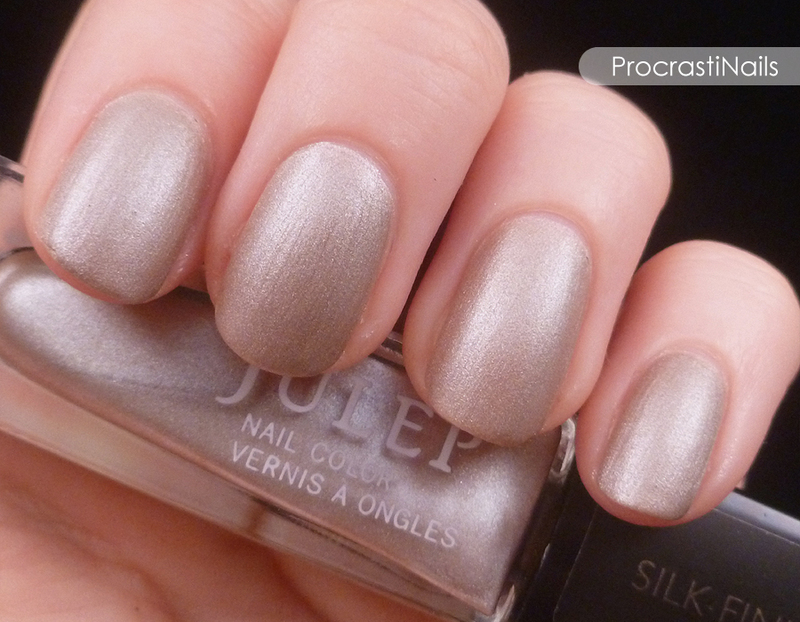 This sandy taupe went on perfectly with three coats. Hope was one of the other disappointments in this collection for me. Which is especially unfortunate, because if I'd only picked up one box this month it would have been the It Girl Box because I was so looking forward to this shade! 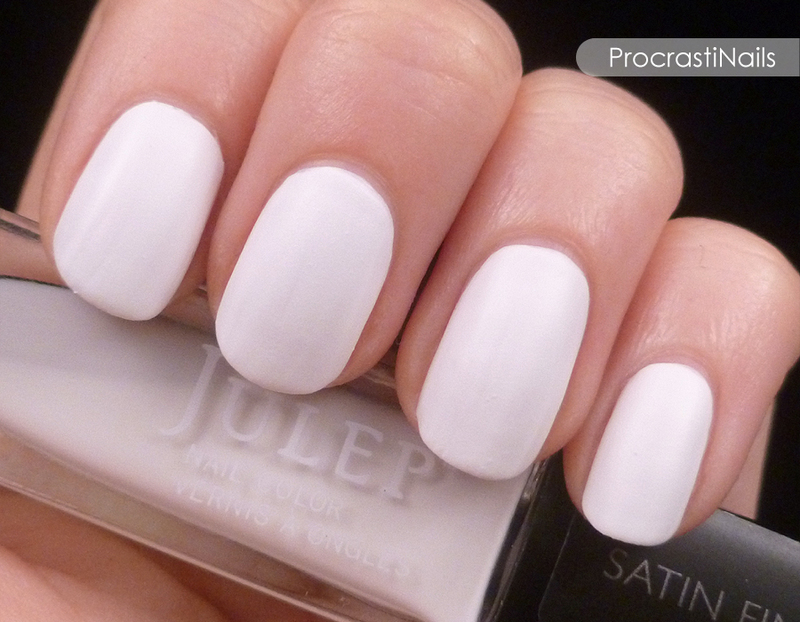 It's described as a "stark white satin." 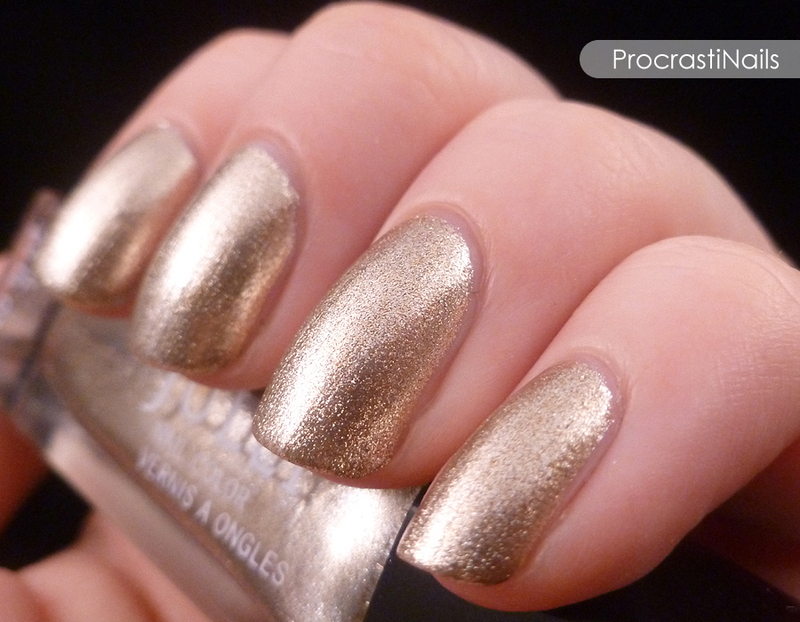 Like the other satin polish in this set (Mae) I expected more from the finish than what I got. 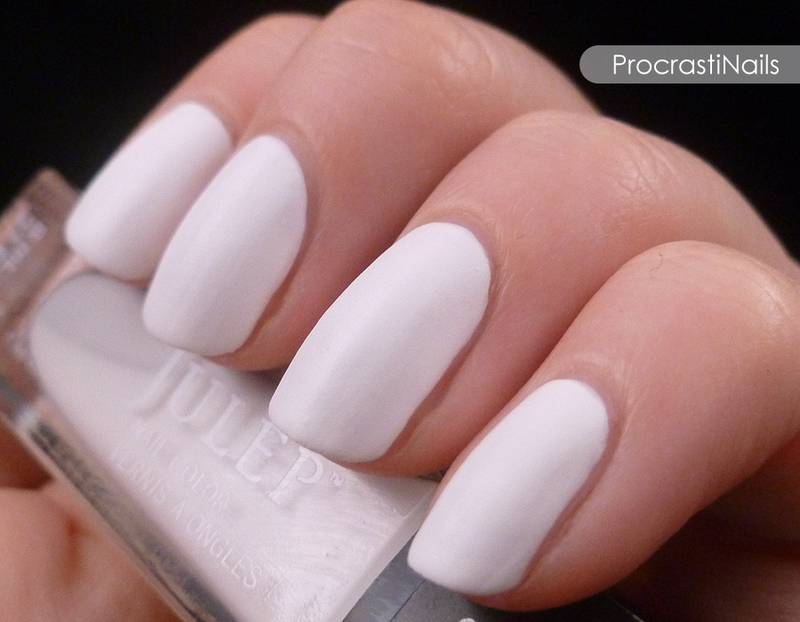 In fact, this polish kind of reminds me of white out. :/ Pictured here is four coats, which was needed because otherwise it was a bit streaky and not quite opaque. And watch out for brush lines! This will probably be a good base for nail art, though. I have a small complaint this month, but it has nothing to do with the polish (though the satin finishes were a let down for sure). 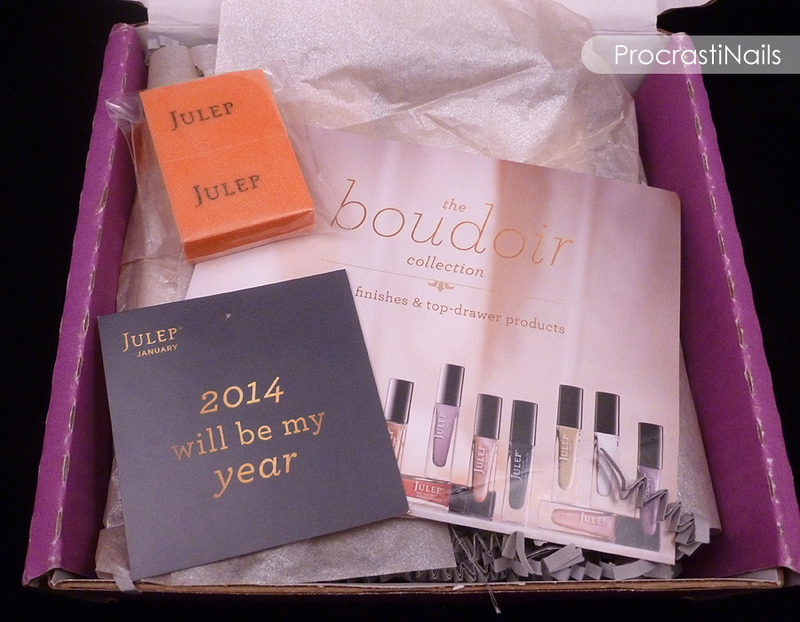 Julep seems to have changed their shipping partner again, and because of that it took me almost twice as long to get my box this month. :( I'm going to see if that improves over the next while, but if not it is definitely going to factor in when I decide if I want to renew my subscription or not. I'll keep you posted!